Home / How to obtain Amazon Payment credentials? The Amazon Pay is a payment option that enables store owners to accept payments on their store seamlessly. The Amazon Seller Central is an enterprise of Amazon.com that enables merchants to sell their products directly to Amazon’s customers. It is different from Amazon Vendor Central which is available for only manufacturers and distributors. To use our ELEX Amazon Payment Gateway for WooCommerce plugin, you need Amazon Seller Central credentials. In this article, we’ll understand how to get these credentials, step-by-step. Go to Amazon Seller Central registration page and sign up for a seller account. The registration process is pretty straight-forward. Amazon provides two sets of credentials that will help you integrate Amazon Pay with your WooCommerce store. Sandbox credentials – Used for testing purposes. You can use these credentials to try out the settings and transaction process. Production/Live credentials – Used for real payment transactions. 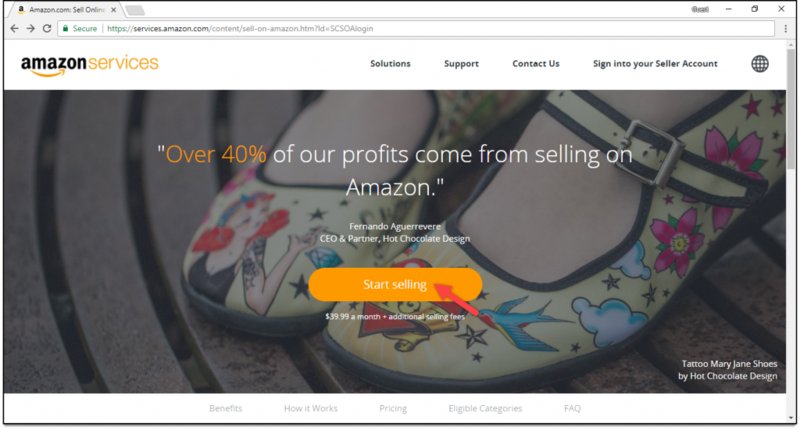 The plugin requires your Amazon Payment’s Merchant ID, Access Keys, Secret Keys, Amazon Client ID, and Amazon Client Secret. Let us first obtain the Sandbox credentials. Login to your Account Seller Central account. Select Amazon Pay (Sandbox View) from the drop-down located in the top section, as shown in the screenshot below. To receive your Merchant ID, hover to the Settings menu on the top right corner of the page and select Integration Settings as shown in the below screenshot. Below screenshot shows how the Merchant ID is displayed. Copy the provided Merchant ID and paste it into the Merchant ID settings in our plugin. To obtain other credentials, click on MWS Access Key from the INTEGRATION menu, as shown in the below screenshot. Next, your Amazon Pay and Login with Amazon Credentials are as shown in the screenshot below. Copy your Access Key, Secret Access Key, Client ID, Client Secret and paste it into the respective settings in our WooCommerce Amazon payments plugin. You need to click on respective Show Secret buttons to display your Secret Access Key and Client Secret. 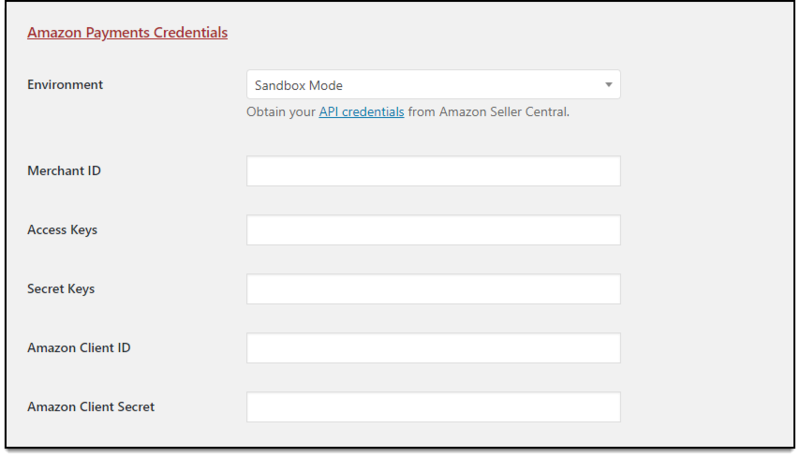 In this way, you can add your Amazon payment Sandbox credentials to our Amazon Payment Gateway for WooCommerce plugin. 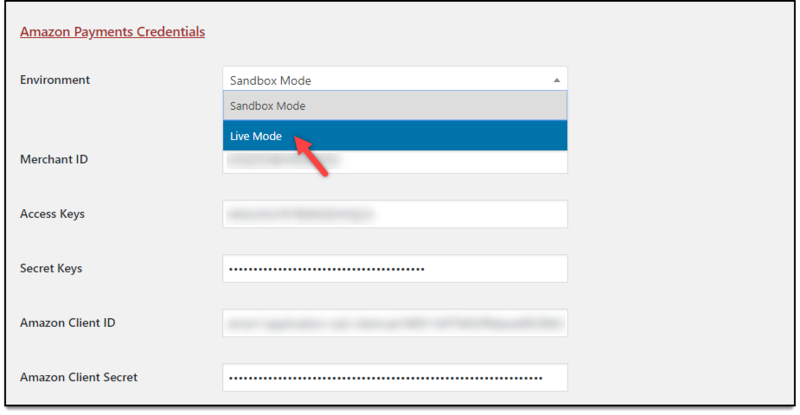 Remember to select Sandbox mode in the Environment setting of the plugin when using Sandbox credentials. 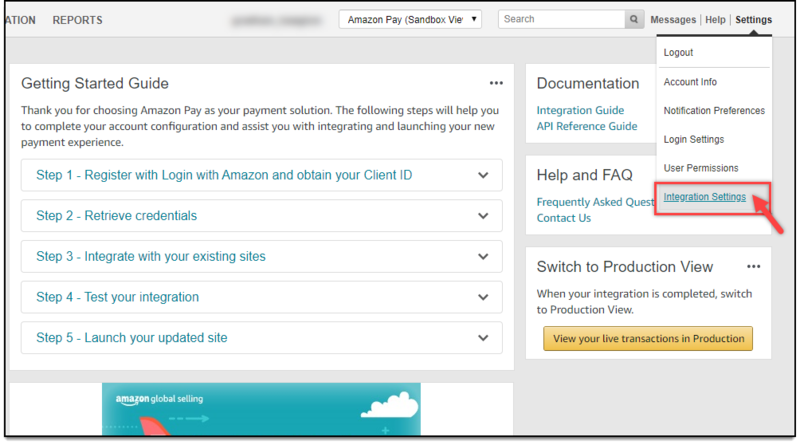 Switch to production view by selecting Amazon Pay (Production View) from the drop-down list located in the top section, as shown in the below screenshot. The process of obtaining live credentials is similar to that of obtaining sandbox credentials. Follow the steps that I have explained for Sandbox credentials in the previous section. One important point to remember here is to switch to Live mode in our Amazon payment plugin settings. If you use live credentials while selecting Sandbox option in the Environment setting of the plugin, the payment transactions will not be possible. Hence, always remember to select the respective transactions modes in the Environment setting when using the desired credentials.